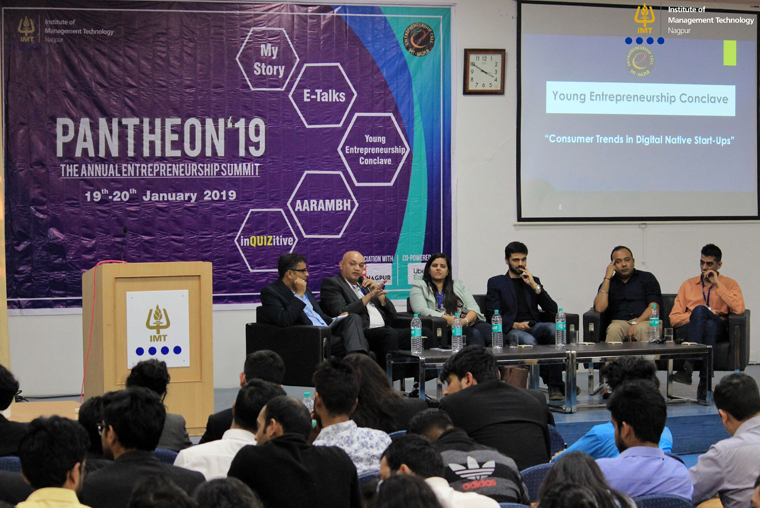 Institute of Management Technology (IMT), Nagpur witnessed an ostentatious event, Pantheon'19-The Annual Entrepreneurship Summit on January 19 and 20, 2019. This occasion saw the congregation of aspiring entrepreneurs and start-up founders from the corporate galaxy. The event commenced with Dr Rajiv Josh, Faculty Chairperson of Entrepreneurship Cell Committee (ECC), welcoming and felicitating the prestigious guests and encouraging the participants with his words of wisdom. The Institute was privileged to host Mr Milind Chittawar (President, TiE Nagpur), Mr Shubham Rai (Founder, NODD), Dr Nihar Shah (Director, Silver Bright), Ms Priyanshi Choubey (COO and Co-Founder, InstaCar) and Mr Rahul Gonsalves (CEO and Founder, Darwyn Ventures). The two-day summit saw events like ‘Aarambh- The National Level B-Plan Competition’ wherein the aspiring entrepreneurs from various institutes showcased their out-of-the-box business ideas in front of the respected jury members. There were close to seventy registrations for ‘Aarambh’ from which top sixteen teams were selected to battle it out during the event. This occasion also saw inspiring and interactive ‘E-Talks’ sessions which were organised in association with the Alumni Committee of the Institute, where Ms Priyanshi Choubey (COO and Co-Founder, InstaCar), Ms Neha Jain (Co-Founder, Z Nations Lab), Ms Nidhi Saraf (Founder and CEO, Key Ventures) and Mr Vinod Keni (Partner, Artha Venture Fund and Co-Founder, Peachtree Mgmt Advisors, TiE Mumbai) shared some valuable insights on various paraphernalia of entrepreneurship. Pantheon’19 also witnessed an event ‘MyStory’, wherein the alumni of IMT Nagpur, Mr Shubham Rai (Founder and CEO, NODD) and Mr Indranil Datta (Founder, DreamKats) narrated the course of their entrepreneurial journey and the challenges they faced in starting their own venture. A quiz competition named 'inQUIZitive' was conducted which tested the business acumen of the participants and also assessed the current awareness and knowledge pertaining to various start-ups. The event reached its culmination with Young Entrepreneurship Conclave (YEC), where a panel discussion was facilitated amongst the esteemed guests and was convened by Dr Rajiv Joshi, on the topic ‘Consumer Trends in Digital Native Start-ups’. It was followed by felicitation ceremony wherein the best entrepreneurial ideas were awarded with trophies and cash prizes. The winner of 'Aarambh- The National level B-plan Competition' was Team 'Ignite' (SIBM Pune), followed by Team 'Cortex' (BITS Pilani) which bagged the first runner-up position and Team 'Hydropreneurs' (IMT Nagpur) attained the second runner-up position. The winner of inQUIZitive was Team 'Aman Square' (IMT Nagpur), followed by Team 'Conquerers' (IMT Nagpur) securing the runner-up position.